My husband is a huge New England Patriots fan (I know, I know, you either love them or hate them) but he loves them—especially Tom Brady. He’s always wanted to go see a game in person and we finally decided to bite the bullet and go this season. We picked the Patriots/Packers game and packed our bags for Boston, MA! We arrived in Boston after a few hours of delay due to weather and checked into our hostel. We stayed at the Hi Boston Hostel which was in a great location! It was definitely the most expensive hostel we’ve stayed in but also the nicest. 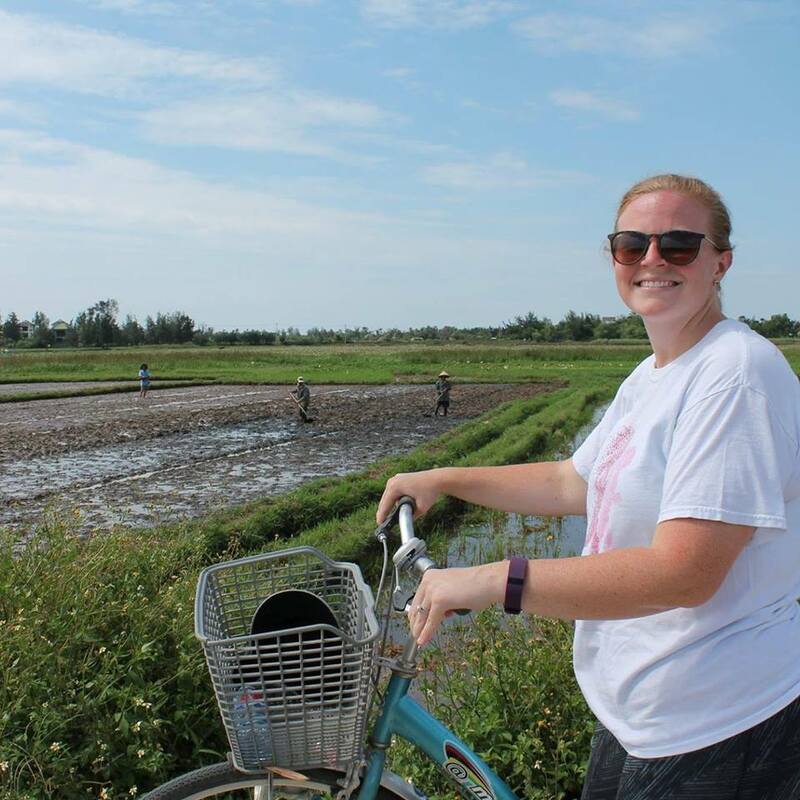 Their mission, which is to help all gain a better understanding of the world and it’s people through travelling, is something we can get behind. While we paid upwards of $250/night for this hostel, it was in a great location (just a 5-10 minute walk from Boston Common) and included free breakfast. For this price at this location, I would totally recommend staying here if taking a trip to Boston! We checked into our hostel, dropped our stuff, and immediately headed out into the city for a night out! We were determined to make the most of our short stay in Boston and we did just that. We headed to Bell in Hand Tavern, America’s oldest operating tavern for drinks and lobstah. This place is charming as hell. 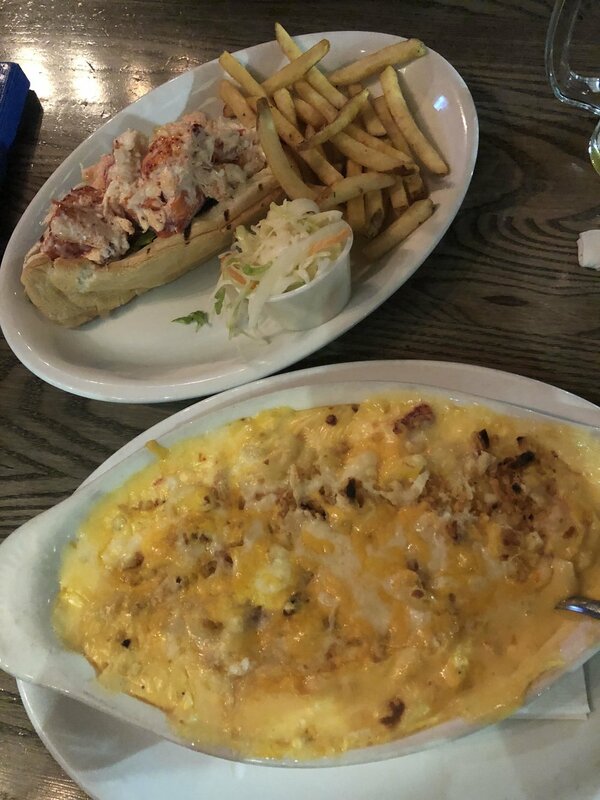 I ordered the Lobster Mac and Michael ordered the Lobster Roll. Both were good but the Lobster Roll was on point and definitely our favorite. We got up, had breakfast and hit the pavement for our first full day exploring Boston. We started with the Freedom Trail, which is a collection of sites around Boston that provide visitors with a pretty great history lesson. 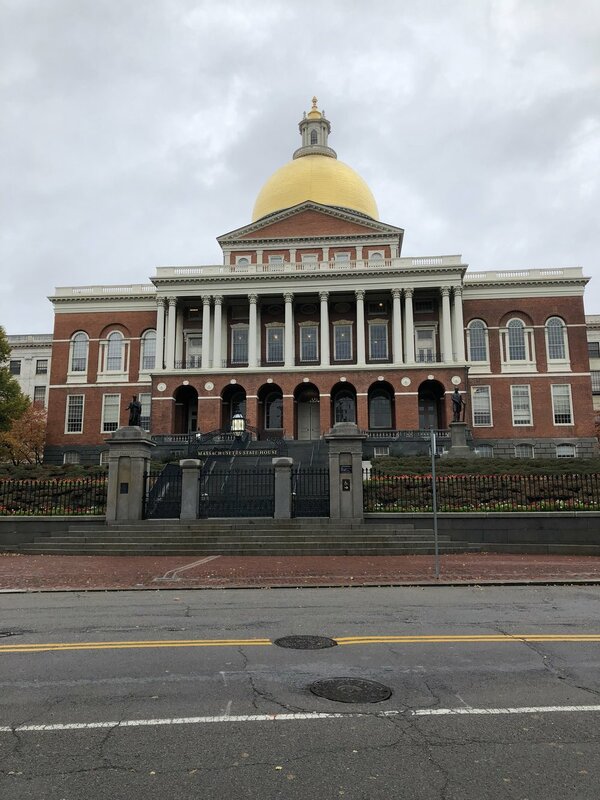 We opted to do the Freedom Trail on our own and it took us nearly 3 hours to see everything but we had a great time learning about the history of Boston. 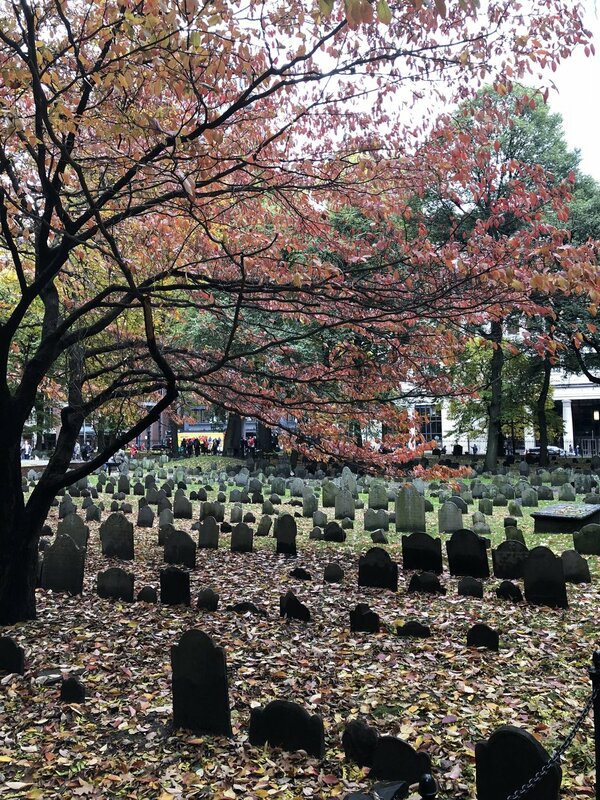 Government buildings, churches, burial grounds all make up the Freedom Trail. We also visited Paul Revere’s House as part of the Freedom Trail and then wandered around the North End, or “Little Italy.” This was one of my favorite parts of the city. We wandered back over to Quincy Market where we had lunch. 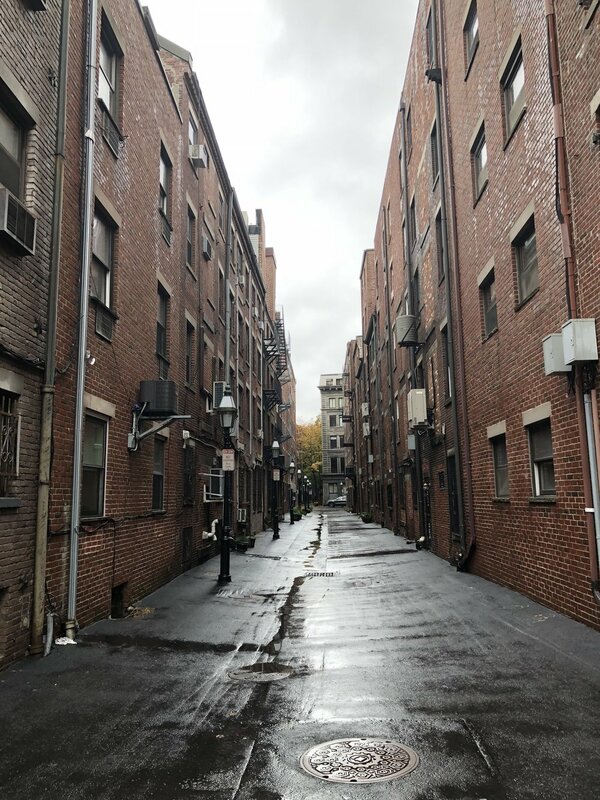 After a brief rest back at our hostel, we headed out to the Beacon Hill neighborhood to see the popular Acorn Street architecture and beauty. We had a delicious Italian dinner in Little Italy at Bacco and then walked back to our hostel. After walking literally all day, our feet were tired and we needed a good night’s rest. We decided to spend the majority of our day in Cambridge. We took the T (the subway) out to Harvard and spent our time strolling around this beautiful campus. We tried to blend in and pretend that we actually attended school at Harvard but I’m sure people were on to us. Taking the subway to Cambridge. 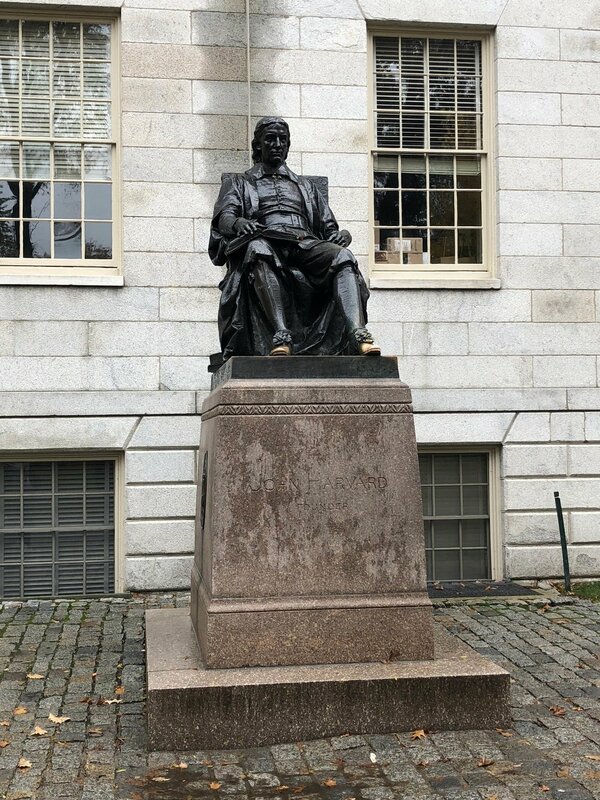 John Harvard. Apparently it’s good luck to rub his toes. One of my very favorite parts of traveling in Boston was the foliage. The changing colors were stunning and it really felt like fall! After walking around the campus, we continued walking towards Central Square, stopping at Lamplighter Brewing and Longfellows for a drink and a quick bite to eat. We then walked through town and walked along the Charles River and took in some gorgeous views while enjoying some of the best ice cream I’ve ever had from Toscanini’s! It was super windy out (there was even a wind advisory in place!) but we managed to get a selfie. After taking the T back to Downtown Crossing and walking around a bit more, we went back to our hostel for a rest. Dinner tonight was cheap but delicious. We ate huge slices of pizza and garlic bread at Boston Kitchen Pizza, a pizza joint right down the street from our hostel. We then went to a bar and drank and watched the LSU/Alabama game. We spent all day doing all things New England Patriots. 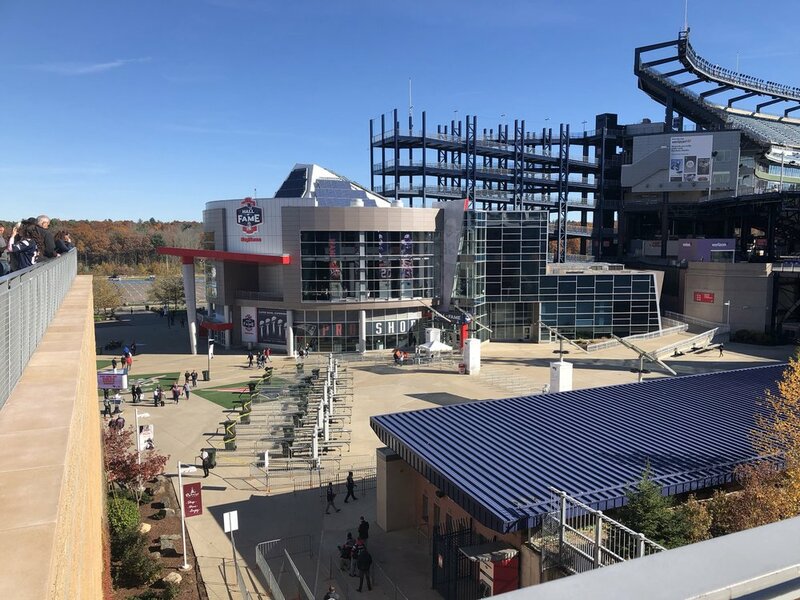 We took the Commuter Rail out to Walpole and then got an inexpensive Lyft to Gillette Stadium where we spent most of our morning touring the Patriots Hall of Fame. Michael spent the entire morning geeking out and taking tons of photos. After touring the Hall of Fame, we walked around Patriots Place, ate lunch, and waited for the game to start. We had a blast at the game and luckily the Patriots won and beat the Packers! Today we woke up, had breakfast, and checked out of our hostel. They held our bags for us at reception as we went out for our last day on the town. 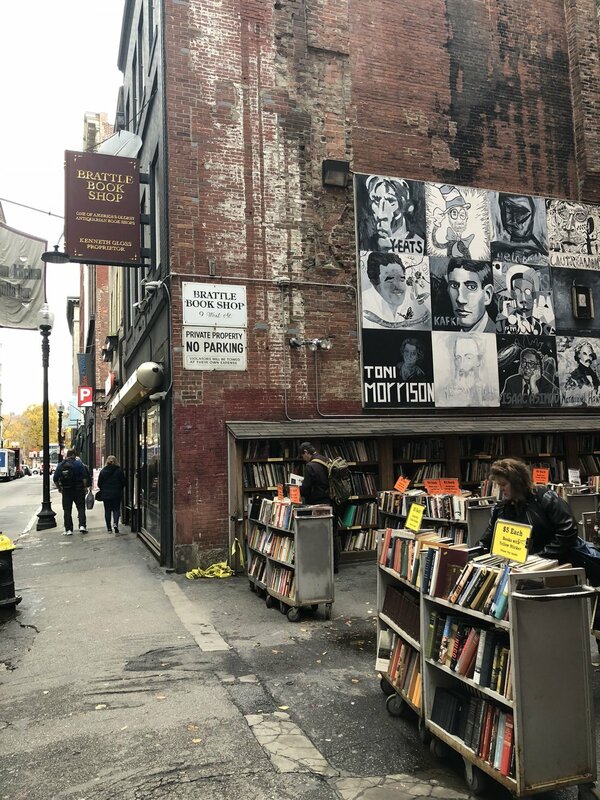 We wandered around and stumbled onto some pretty cool places like the Brattle Book Shop, one of America’s oldest used bookshops featuring three floors of unique books and even an outdoor section. We continued wandering and eventually made our way back up to the Quincy Market area to have our last lunch. Clam Chowder and a Lobster Roll for my last Bostonian lunch. After lunch we walked and walked and walked and eventually ended up back out our hostel ready for our flight back to Charleston. And that’s how we spent a long weekend in Boston and I’ve got to say, we loved it. Traveling within the U.S. isn’t our normal thing, and it’s mainly because it costs so much to travel within the U.S., but we really enjoyed this short trip. We will most definitely be traveling back!